Mystery surrounds the famous Saint Valentine who some say lived in ancient Rome circa 280 AD. Legend has it that he restored sight and hearing to the daughter of his jailer while imprisoned by the Romans for his steadfast belief in Christ. Centuries later, this great act of spiritual love is commemorated with a modern celebration of romantic love – on Valentine’s Day, next week on the 14th. I am smitten by the idea of this holiday for two reasons. First, my granny always made holidays so special in our house and Valentine’s Day was no exception. One year, she made me a set of tiny, hand-sown pin cushions, trimmed in beige antique lace, for my sowing basket. 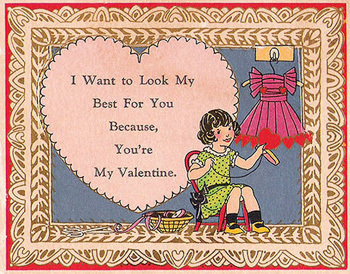 Secondly, I’m a real romantic at heart, but I’ve always loved the idea of gentler, more old-fashioned Valentine gestures. Perhaps this year, you’ll suddenly learn of a secret admirer for the first time, receive a hand-written love note signed only with one initial or give handmade chocolates nestled in a crisp paper box to someone you love. I never spend Valentine’s Day in a crowded restaurant. I’ve had too many experiences with irritable waiters pushing you through a meal to get in another couple before the end of the night. Besides, most restaurant cooks detest Valentine’s Day rush and those feelings somehow show up in the food. But what if you’re craving something sumptuous? You might really want to throw caution to the wind and spoil your sweet heart with foods that are rich and caloric for once. If you want to go that route, making it yourself with love, is always the best way. Whether you decide to go the more healthy route with lighter recipes or choose the full fat version, be smart about it and make something that uses mono or polyunsaturated fats instead of saturated fat. Saturated fat is considered the “bad” fat by health professionals because it will raise blood cholesterol and studies show that a diet high in saturated fat will lead to heart disease. Having high levels of blood cholesterol is not only a major risk factor for coronary heart disease, but will also increase your risk for stroke. Which foods normally contain high levels of saturated fats? Which foods contain mostly poly or monounsaturated fats and are low in saturated fat? Avocado – High in Vitamin K, fiber and potassium, and contains oleic acid, a monounsaturated fat that may help you lower cholesterol. Avocadoes are gorgeous with chocolate – try my avocado chocolate shake, so creamy and indulgent. They won’t even know that it’s made with avocado! Olive oil – Include oils in your diet that are high in polyunsaturated fats like olive oil, which may lower LDL (the “bad cholesterol”). Olive oil also happens to be rich in polyphenols, powerful antioxidants that can help to protect artery walls and blood vessels. Use olive oil to make a moist and delicious cake that is an Italian classic. anti-inflammatory benefits – it’s not only great for heart-health but can improve the look of your skin and help joints to function smoothly. If you’re not a big sweet eater, a little bite-size cashew cookie made with ground flax is the perfect ending to a lovely meal. Walnuts – Nuts are low in saturated fat and a dream to bake with. Like flax they are also high in omega 3’s which can help protect your health and also improve your mood. Cinnamon scented nutroll is a treat to win over any nut fan, generously filled with ground walnuts. Read this comprehensive guide to how fat affects your health (from Harvard Health Publications). Read more about why flax is a must in your diet. Just in time for Valentine’s Day: In this TV segment, I highlight how to use Beets for your Sweet. Awww….that is so cute! I love this post! You really are after my own “heart” Happy Valentines!